This comprehensive tour gives us a great experience of Sri Lanka’s cultural heritage, natural beauty and friendly and hospitable people. 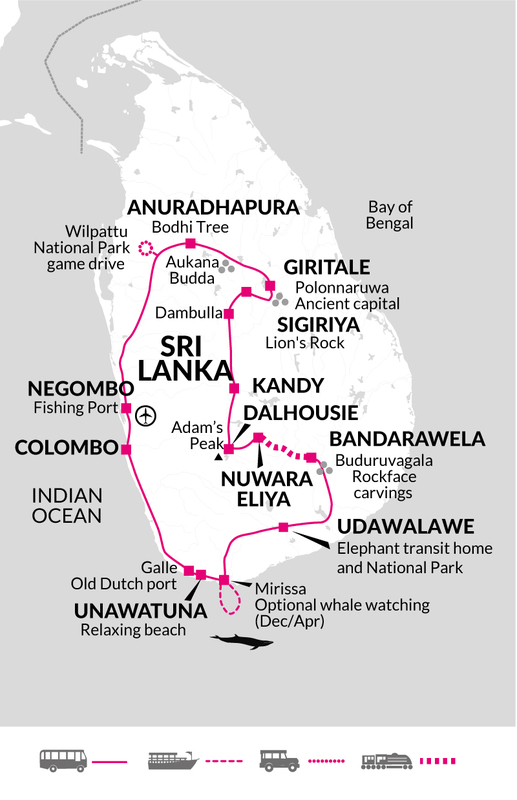 By using local tour leaders you’ll be able to enjoy and learn about many aspects of life in Sri Lanka not accessible on other trips, and of course it is a significant way to create local employment. We are encouraged to minimise use of water, towels and bedding throughout the tour in order to help the hotels reduce their energy consumption. The food in Sri Lanka remains exceptionally local, with fresh organic vegetables whilst in the central highlands and beautiful fresh seafood along the coast. We travel in groups no larger than 18 people. This allows us to use a small bus which is much more suitable for the roads in Sri Lanka, particularly traveling between Kandy and Nuwara Eliya. We use local leaders for all of our tours in Sri Lanka as we feel that they can offer a great insight in to the culture of this beautiful country. Our Tour Leaders are passionate about Responsible Tourism and brief each group on arrival. They are also on hand throughout the trip to offer advice on how to get the best from each location without causing any damage or offence, and by contributing to the economy. We use locally owned accommodation throughout this tour. In some areas there are limited options for eating in local restaurants but wherever possible, particularly on the coast we eat out in local restaurants and make the most of the wonderful food Sri Lanka has to offer.